I was looking for a good scary book when I came across this lovely book in Barnes and Noble. The cover immediately attracted me with its creep factor. "I am where dead children go." That sentence alone had me walking to the cash register credit card in hand. 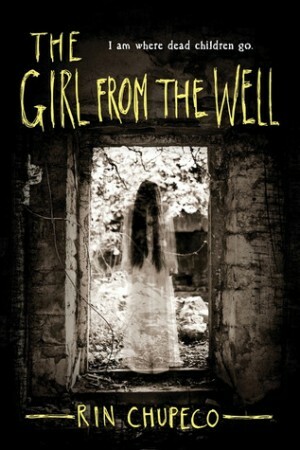 I enjoyed reading this book, it was so good and a few parts even managed to freak me out a bit. Okiku died a few hundred years ago and she is left to walk the earth. She avenges children that were murdered, setting their souls free to move on - while she stays to wander. She comes across a young boy named Tark, he has a darkness around him that she can't help but hang around. For the first time ever Okiku gets close to person that is alive, she wants to protect both Tark and his cousin Callie. Will she be able to fight off the darkness that wants to swallow up the fifteen year old boy? This is the first book I have ever read from the point of view of the ghost. Normally it's someone is being haunted by said ghost but I really liked the change up. Okiku is an avenger, who would be mad at her anyway? She's killing people that kill children, she's like the ghost version of Dexter. Her killing scenes were honestly my favorite scenes, it felt like I was watching a movie. Rin Chupeco really knows how to write a creepy scene and I loved it! Though I understood and liked the writing style, I can see where some people could get confused. Okiku had a thing with counting that could be considered distracting. I liked the counting, and thought the thing about the number nine was actually kind of funny to imagine. I look forward to reading the second in this series and anything else by Rin Chupeco!